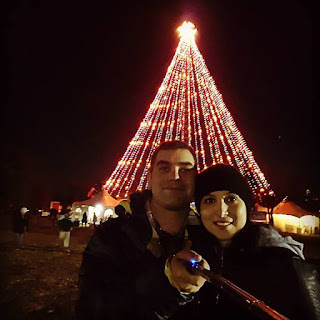 On the 18th of December, Linda and I headed out to the Trail of Lights in Zilker Park, here in Austin. The Trail of Lights (TOL) is similar to Santa's Ranch and the Hidalgo Festival of Lights; the difference is that people walk, not drive, through the TOL. Before going, I thoroughly checked to see if pets were allowed, but unfortunately, they wanted BeeGee (and her soon-to-be-included sister) to stay home. Our trip, on a chilly night, began with a Capital MetroRail ride downtown and then a shuttle ride to Zilker Park. Selfie at the Zilker Tree! The Trail of Lights (TOL) began in 1965 as the Yule Fest and is now 1.25-miles long. After 50 years, TOL has evolved from a small community event into the large event that it is today. There are multiple activities at TOL: there is a fun run, pictures with Santa, a Yule log, a Ferris wheel and carousel, food trucks, live performances, and the lighting of the Zilker tree. General admission is $3, but there are a few other/fancier ticket options available. Knowing from prior years that traffic around Zilker Park would be backed up; we reserved two spots on a shuttle ride, which you can purchase at the TOL’s website. We rode the Capital MetroRail to the downtown station, and then walked a few blocks to Republic Square Park, one of the two sites from which passengers are shuttled to the TOL. The other site from which to grab a shuttle is Burger Center. Both shuttle rides cost $5 for both to the TOL and from the TOL and include the entrance fee for the TOL, which I thought it was a pretty good deal. However, if you still prefer to face the traffic, then you can pre-purchase parking online (none sold on-site). The shuttles drop everyone off at the Zilker tree and we incorrectly thought this was the beginning of the TOL. We wandered around for a bit, looking at the tree and merchants set up under the large Christmas light tree. After trying to meet up with some friends, we eventually realized this wasn’t the right spot, aka the entrance. Once we eventually made it to the real entrance, we met up with our lost friends (Linda and I were actually the lost friends). We walked through the entrance and the Rainbow Tunnel. After that, there a few exhibits such as future Santa that looked like something from the Jetsons and a few Disney exhibits. We stumbled across Armadillo Alley and took a short break to eat at Evil Weiner. Moving on we saw the Journey of the Kings and Silent Night, which features a very large baby Jesus. Further along, we found the 360 Bridge replica, which I thought was extremely neat. Linda has never seen the bridge, so she was less than excited. The next exciting exhibits on our walk were the Bat Cave (a tunnel with bat silhouettes) and Santa’s Workshop. This brought us to the next food area, The North Pole. The North Pole contains the Ferris wheel and Photos with Santa. I was excited about the Ferris wheel; however, tickets are $6 and I just couldn’t justify riding it for twice the price of an entrance ticket. Not riding the Ferris wheel and skipping pictures with Santa, we continued on to Santa's Workshop. Next, we headed to Tiny Town, a miniature Austin, which I thought was a great exhibit. You could also hit a button to “vote” on whether you are naughty or nice, which would change the color and kept a running tally of the votes. As you can guess, I was nice and Linda was naughty. Shortly passed Tiny Town was the Yule log, and I was hoping to be warmed up by the fire. Unfortunately, all the warmth was too far away. We finished up our walk by walking through Candyland and past the carousel ($4 per rider). After that we were at the exit tunnel, ending a night that just seemed too short (I wish there were more lights!). What are your thoughts on the Trail of Lights and what type of Holiday events are in your area? If you like the blog, go ahead and follow us on Facebook. Jarrett, does Austin still run the dillos? I never see or hear anything about the dillo tours. I had to Google it to see. It looks like the Dillo tours stopped in 2009 because of declining participation.